Inspired by the desire to improve her community and improve herself, Candy Chang, an urban planner and artist, creates projects that collect our hopes, fears, and stories in public space to help us lead better lives. Her recent work, Before I Die, transformed an abandoned house in her neighborhood in New Orleans into an interactive wall for residents to share their hopes and dreams. 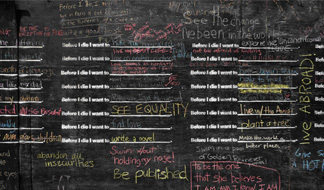 Painted with chalkboard paint and stenciled with the sentence “Before I die I want to _______”, the wall becomes an enlightening way to get to know your neighbors and discover the hopes and aspirations of the people around you. It creates a public space for contemplation and reminds us why we want to be alive in the world today. This wall is turning into a global participatory art project and expanding to cities around the world, including Amsterdam, Portsmouth, Querétaro, San Diego, Lisbon, Brooklyn, and beyond…and now Forsyth County! 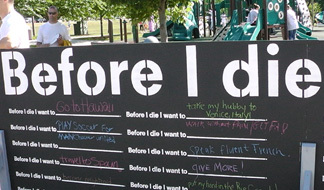 We have created a mobile “Before I Die…” wall, which has been enjoyed at events such as the annual Elder Abuse Awareness Walk, Alzheimer’s Walk, Kernersville Spring Folly & Senior Healthy Living Day. Our goal is to build community by displaying the wall at various local events, encouraging folks to participate by sharing their dreams and aspirations. Please contact us if you would like to have us bring the wall to your event. If you’d like to learn more about this and other innovative urban projects, visit Candy' Chang’s website.